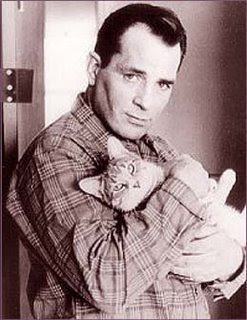 Today, would have been the 87th Birthday of Jack Kerouac, America's greatest journal writer. I outlined a good many of Jack's traits of a Knight of the KMSA, in an essay about his life on the blog on March 12th 2008, when we were visiting many of his old haunts in New York. The Founding Fathers kindly gave him an Honorary membership. Jack would have loved blogging for the KMSA, if such things had been available to him. I'm thinking he would have been a member of a hundred blogs, such was his dedication to discovering and experiencing his interior life, jousting with other cerebral minds and provoking and inspiring in equal measure. 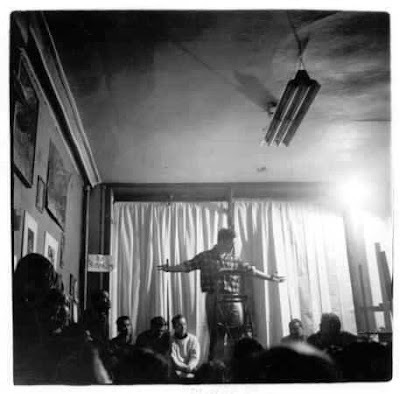 You only have to google the name Kerouac, and thousands of interesting sites appear, not just about him...but mostly sites belonging to like minded artists and writers and creators, all who recognise the howl of his spirit in themselves. And so the name goes on, linking artists to artists, the curious to the curious. Jack though, computers or no computers, would never have made it to 87 years of age. As it was he only made 47. He was definitely a burn out and not fade away kind of guy, as was his kindred spirit Neal Cassidy. In his later years, when he gradually tired of running so hard, and residuals from his writing softened some of his hunger, he took to trying to sum up life in succinct Haiku's, something he learned about from his friend Gary Snyder, while writing the "Dharma Bums", reading them out with gusto and wine at poetry meetings in New York and San Francisco. "The American Haiku is not exactly the JapaneseHaiku. The Japanese Haiku is strictly disciplined to seventeen syllables but since the language structure is different. I don't think American Haiku's (short three-line poems intended to be completely packed with Void of Whole) should worry about syllables because American speech is something again...bursting to pop. Above all, a Haiku must be very simple and free of all poetic trickery and make a little picture and yet be as airy and graceful as a Vivaldi Pastorella." And so I leave you to toast Sir Jack of America, on this, his day, with a selection of his neatest Haiku, and I hope they inspire you to observe, think about, and appreciate the very day you are living in. For me the perfect American Haiku is one that says so much in just three lines , that I can instantly imagine the scene and all the five senses , and I could then go write a 2000 word short story based on the life within. Perhaps we should start a new Internet networking site, ala Tweeter, but only allow three lines to express yourself. I'm still of 17 syllable type of poet. Just reserved haicooc.oom, where counting coo with your friends in haiku will be the next social networking explosion. Need a logo Sir D!